I love refinishing furniture. It’s so much more satisfying than buying something new and is much less expensive. The transformations are so fun to watch. I found this set on craigslist.org for around $30. I actually liked the weathered blue and red chairs, but they just weren’t our style. After a little work they fit perfectly in my daughter’s pink bedroom. 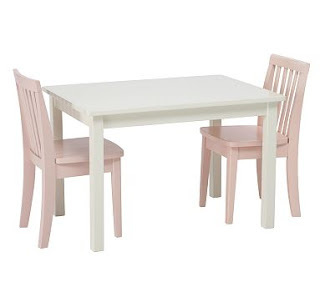 A few coats of antique white and light pink paint and the table and chairs have new life. The process was easy. I lightly sanded the table and chairs, then covered with spray paint. Yes, the kind from a can at Home Depot. Once the paint was completely dry I went over the edges with sandpaper for a distressed look. Pottery Barn Kids has a similar table and chairs here. It retails for $237, but is on sale for $199. It will be so fun when the girls can sit at the table together for crafts, games, and tea parties. Until then, L can use the chairs to practice standing up ♥ It’s a great photo prop too! More furniture re-dos coming soon! If you’re dying to see more furniture transformations right this minute, check out Holley’s gorgeous work at Life in the Fun Lane. I'm having a recipe link party on my3littlebirds today and I'd LOVE for you to contribute a recipe. You're quite the cook! you did such a great job, total transformation. Bravo, I am re-doing our bathroom cabinets currently. WOW thats incredible!! They look amazing and are just so cute 🙂 That's one lucky little girl! Super cute! I'm gonna have to try the spray paint idea… so much faster than paintbrushing it! Oh my goodness–how darling. 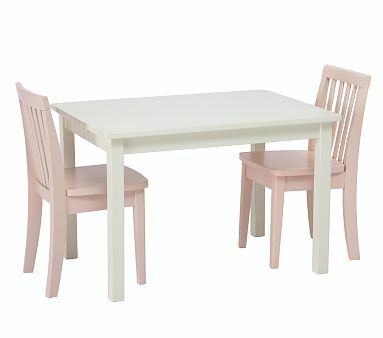 I have been collecting chairs for my granddaughter & I'm looking for the right table. So fun!